Cookware and bakeware are categories of food preparation utensils commonly found in the kitchen. Cookware consists of cooking vessels, such as saucepans and frying pans, intended for use on a stove or range cooktop. Bakeware consists of cooking vessels intended for use in an oven. Some utensils serve as both cookware and bakeware. Cooking utensils are typically referred to as "pots" and "pans," but they vary in shape. The size and shape of a utensil is typically determined by its intended use. The use of cooking vessels before the development of pottery is unclear because the archaeological evidence is limited. Some researchers, however, have extrapolated likely developments based on methods used by later peoples. Among the first of the techniques believed to be used by Stone Age civilizations were improvements to basic roasting. Besides exposing food to direct heat from an open fire or hot embers, the food could have been covered with clay or large leaves before roasting to preserve moisture in the food. Examples of similar techniques can be found in many modern cuisines. Of greater difficulty was finding a method to boil water. For people without access to natural heated water sources, such as hot springs, heated stones could be placed in a water-filled vessel to raise its temperature (for example, a leaf-lined pit or the stomach from animals killed by hunters.). In many locations, the shells of turtles or large mollusks provided a source for waterproof cooking vessels. Bamboo tubes sealed at the end with clay would have provided a usable container in Asia. The inhabitants of the Tehuacan Valley in Pueblo, Mexico, began carving large stone bowls that were permanently set into a hearth as early as 7000 B.C.E. According to Frank Hamilton Cushing (July 22, 1857- April 10, 1900), Native American cooking baskets used by the Zuni (Zuñi) developed from mesh casings woven to stabilize gourd water vessels. He reported witnessing cooking basket use by Havasupai in 1881. Roasting baskets covered with clay would be filled with wood coals and the product to be roasted. When the thus hardened clay separated from the basket, it would become a usable clay roasting pan in itself. This indicates a steady progression from use of woven gourd casings to waterproof cooking baskets to pottery. Other than in many other cultures, native Americans used and still use the heat source inside the cookware. Cooking baskets are filled with hot stones and roasting pans with wood coals. The development of pottery allowed for the creation of fireproof cooking vessels in a variety of shapes and sizes. Coating the earthenware with some type of plant gum, and later ceramic glazes, converted the porous container into a waterproof vessel. The earthenware cookware could then be suspended over a fire through use of a tripod or other apparatus, or even be placed directly into a low fire or coal bed as in the case of the pipkin or cazuela de barro. Ceramics (including stoneware and glass) conduct poorly, however, so ceramic pots must cook over relatively low heats and over long periods of time (most modern ceramic pots will crack if used on the stovetop, and are only intended for the oven). Although metal pots have come into widespread use, earthenware pots are still preferred among the less well-off, globally, due to their low production cost. The development of bronze and iron metalworking skills allowed for the manufacture of cookware made from metal, although adoption of the new cookware was slow due to the much higher cost. After the development of metal cookware, there was little new development, with the standard Medieval kitchen utilizing a cauldron and a shallow earthenware pan for most cooking tasks, with a spit employed for roasting. By the seventeenth century, it was common for a western kitchen to contain a number of skillets, baking pans, a kettle, and several pots along with a variety of pot hooks, and trivets. In the American colonies, these items would commonly be produced by a local blacksmith from iron, while brass or copper vessels were common in Europe and Asia. Improvements in metallurgy during the nineteenth and twentieth centuries allowed for the economical production of pots and pans from metals such as steel, stainless steel, and aluminum. Metal pots are made from a narrow range of metals because pots and pans need to conduct heat well, but also need to be chemically unreactive so that they do not alter the flavor of the food. Most materials that are conductive enough to heat evenly are too reactive to use in food preparation. In some cases (copper pots, for example), a pot may be made out of a more reactive metal, and then tinned or clad with another. Aluminum is a lightweight metal with very good thermal conductivity. It does not rust, and is resistant to many forms of corrosion. Aluminum can, however, react with some acidic foods to change the taste of the food. Sauces containing egg yolks, or vegetables such as asparagus or artichokes, may cause oxidation of non-anodized aluminum. Since 1965 circumstantial evidence has linked Alzheimer's disease to aluminum, but to date there is no proof that the element is involved in causing the disease, and it is now considered unlikely. Aluminum is commonly available in sheet, cast, or anodized forms. Sheet aluminum is spun or stamped into form. Due to the softness of the metal it is commonly alloyed with magnesium, copper, or bronze to increase its strength. Sheet aluminum is commonly used for baking sheets, pie plate, and cake or muffin pans. Stockpots, steamers, pasta pots, and even skillets are also available from sheet aluminum. Cast aluminum produces a thicker product than sheet aluminum, making it suitable for saucepots, Dutch ovens, and heavyweight baking pans such as bundt pans. Due to the microscopic pores caused by the casting process cast aluminum has a lower thermal conductivity than sheet aluminum. Anodized aluminum has had the naturally occurring layer of aluminum oxide thickened by an electrolytic process to create a surface that is hard and non-reactive. It is used for sauté pans, stockpots, roasters, and Dutch ovens. Classically in Western cooking, the best pots were made out of a thick layer of copper for good thermal conductivity and a thin layer of tin to prevent the copper from reacting with acidic foods. Copper pans provide the best conductivity, and therefore the most even heating. They tend, however, to be heavy, expensive, and to require occasional retinning. They are now available with stainless steel rather than tin linings which last much longer. They are best for such high-heat, fast-cooking techniques as sautéeing. Stainless steel is an iron alloy containing a minimum of 11.5 percent chromium. Blends containing 18 percent chromium with either 8 percent nickel (called 18/8) or with 10 percent nickel (called 18/10) are commonly used for kitchen equipment. Stainless steel's virtues are that it is resistant to corrosion, it does not react with either alkaline or acidic foods, and it is not easily scratched or dented. Stainless steel's drawback for cooking use is that it is a relatively poor heat conductor. As a result, stainless steel cookware is generally made with a disk of copper or aluminum in or on the base to conduct heat across the base. Carbon steel cookware can be rolled or hammered into very thin sheets of material, while still maintaining high strength and heat resistance. This allows for rapid and high heating. Carbon steel does not conduct heat as well as other materials, but this may be an advantage for woks and paella pans, where one portion of the pan is intentionally kept at a different temperature than the rest. Like cast iron, carbon steel must be seasoned before use. Rub a fat (lard is recommended) on the cooking surface only and heat the cookware over the stovetop. The process can be repeated if needed. Over time the cooking surface will become dark and nonstick. Carbon steel is often used for woks and crepe pans. The enamel over steel technique creates a piece that has the heat distribution of carbon steel and a non-reactive, low-stick surface. Such pots are much lighter than most other pots of similar size, are cheaper to make than stainless steel pots, and do not have the rust and reactivity issues of cast iron or carbon steel. Enamel over steel is ideal for large stockpots, and for other large pans that will be used mostly for water-based cooking. Because of its light weight and easy cleanup, enamel over steel is also popular for cookware used while camping. Cladding, sometimes referred to as "all-clad," is a technique for fabricating pans with a layer of heat conducting material, such as copper or aluminum, covered by a non-reactive material, such as stainless steel. Rather than just a heat-distributing disk on the base, the copper or aluminum extends over the entire pan. Aluminum is typically clad on both the inside and the outside of the pot, providing both a stainless cooking surface and a stainless surface to contact the cooktop. Copper is typically clad on its interior surface only, leaving the more attractive copper exposed on the outside of the pan. Some high-end cookware uses a dual-clad process, with a thin stainless layer on the cooking surface, a thick core of aluminum to provide structure and heat diffusion, and a thin layer of copper on the outside of the pot that provides additional diffusion and the "look" of a copper pot. This provides much of the functionality of tinned-copper pots for a fraction of the price. Modern metal cooking pans are frequently coated with a substance such as polytetrafluoroethylene (Teflon) coating in order to minimize the possibility of food sticking to the pan surface. This has advantages and disadvantages for flavor and ease of use. A small amount of sticking is needed to cause fond (called a glaze); adding liquid to lift the glaze from the pot is called deglazing. Additionally, nonstick pans should not be left on the stove at a high temperature. On the other hand, they are much easier to clean than other types of pots, and do not often result in burned food. When frying in pans without such a coating, it is necessary to use additional vegetable or animal fat to prevent sticking. Nonstick coatings tend to degrade over time, and require vigilant care and attention. In order to preserve the nonstick coating of a pan, it is important never to use metal implements in the pan while cooking, or harsh scouring pads or chemical abrasives when cleaning. There has been controversy surrounding the use of Teflon and Silverstone, as the decomposition products that they produce at high temperatures can be toxic. More recent tests show that this decomposition occurs only at temperatures beyond those attained during cooking. Non-metallic cookware can be used in both conventional and microwave ovens. Non-metallic cookware typically can't be used on the stovetop, but some kinds of ceramic cookware, for example Corningware, are an exception. Glazed ceramics, such as porcelain, provide a nonstick cooking surface. Some unglazed ceramics, such as terra cotta, have a porous surface that can hold water or other liquids during the cooking process, adding moisture in the form of steam to the food. Historically some glazes used on ceramic articles have contained high levels of lead, which can possess health risks. Borosilicate glass, such as Pyrex, is safe at oven temperatures. The clear glass also allows for the food to be seen during the cooking process. Glass ceramic is used to make products such as Corningware, which have many of the best properties of both glass and ceramic cookware. While Pyrex can shatter if taken between extremes of temperature too rapidly, glass-ceramics can be taken directly from deep freeze to the stovetop. Their near-zero coefficient of thermal expansion makes them almost entirely immune to thermal shock. Silicone bakeware is light, flexible, and able to withstand sustained temperatures of 675 °F (360 °C). It melts around 930 °F (500 °C), depending upon the fillers used. Its flexibility is advantageous in removing baked goods from the pan. This rubbery material is not to be confused with the silicone resin used to make hard, shatterproof children's dishware, which is not suitable for baking. Braising pans and roasting pans (also known as braisers and roasters) are large, wide and shallow, to provide space to cook a roast (chicken, beef, or pork). They typically have two loop or tab handles, and may have a cover. Roasters are usually made of heavy gauge metal so that they may be used safely on a cooktop following roasting in an oven. Unlike most other cooking vessels, roasters are usually oblong or oval. There is no sharp boundary between braisers and roasters - the same pan, with or without a cover, can be used for both functions. In Europe, a clay roaster is still popular because it allows roasting without adding grease or liquids. This helps preserve flavor and nutrients. Having to soak the pot in water for 15 min. before use is a notable drawback. Casserole pans (for making casseroles) resemble roasters and dutch ovens, and many recipes can be used interchangeably between them. Depending on their material, casseroles can be used in the oven or on the stovetop. Casseroles are commonly made of glazed ceramics or pyrex. Dutch ovens are heavy, relatively deep pots with a heavy lid, designed to re-create oven conditions on the stovetop (or campfire). They can be used for stews, braised meats, soups, and a large variety of other dishes that benefit from low heat, slow cooking. Dutch ovens are typically made from cast iron, and are measured by volume. Frying pans, frypans, skillets, or spiders (obs. Southern United States) provide a large flat heating surface and shallow sides, and are best for pan frying. Frypans with a gentle, rolling slope are sometimes called omelette pans. Grill pans are frypans that are ribbed, to let fat drain away from the food being cooked. Frypans and grill pans are generally measured by diameter (20–30 cm). Electric griddle with temperature control. Griddles are flat plates of metal used for frying, grilling, and making pan breads (such as pancakes, injera, tortillas, chapatis, and crepes). Traditional iron griddles are circular, with a semicircular hoop fixed to opposite edges of the plate and rising above it to form a central handle. 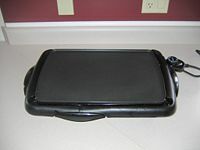 Rectangular griddles that cover two stove burners are now also common, as are griddles that have a ribbed area that can be used like a grill pan. Some have multiple square metal grooves enabling the contents to have a defined pattern, similar to a waffle maker. Like frypans, round griddles are generally measured by diameter (20–30 cm). In Scotland, griddles are referred to as girdles. In some Spanish speaking countries, a similar pan is referred to as a comal. Crepe pans are similar to griddles, but are usually smaller, and made of a thinner metal. Both griddles and frypans can be found in electric versions. These may be permanently attached to a heat source, similar to a hot plate. A copper saucepot (stainless lined, with cast iron handles). Saucepans (or just "pots") are vessels with vertical sides about the same height as their diameter, used for simmering or boiling. Saucepans generally have one long handle. Larger pots of the same shape generally have two handles close to the sides of the pot (so they can be lifted with both hands), and are called sauce-pots or soup pots (3–12 liters). Saucepans and saucepots are measured by volume (usually 1–8 L). While saucepots often resemble Dutch ovens in shape, they do not have the same heat capacity characteristics. Ironically, the saucepan is not the ideal vessel to use for making sauces. It is more efficient to use saucepans with sloping sides, called Windsor pans, or saucepans with rounded sides, called sauciers. These provide quicker evaporation than straight sided pans, and make it easier to stir a sauce while reducing. Sauté pans, used for sauteing, have a large surface area, like a frypan, but with vertical sides to prevent food from escaping during cooking. Stockpots are large pots with sides at least as tall as their diameter. This allows stock to simmer for extended periods of time without reducing too much. Stockpots are typically measured in volume (6-36 L). Stock pots come in a large variety of sizes to meet any need from cooking for a family to preparing food for a banquet. A specific type of stockpot exists for lobsters, and an all-metal stockpot usually called a caldero is used in Hispanic cultures to make rice. Woks are wide, roughly bowl-shaped vessels with one or two handles at or near the rim. This shape allows a small pool of cooking oil in the center of the wok to be heated to a high heat using relatively little fuel, while the outer areas of the wok are used to keep food warm after it has been fried in the oil. In the Western world, woks are typically used only for stir-frying, but they can actually be used for anything from steaming to deep frying. Bakeware is designed for use in the oven (for baking), and encompasses a variety of different styles of baking pans as cake pans, pie pans, and loaf pans. Cake pans include square pans, round pans, and speciality pans such as angel food cake pans and springform pans often used for baking cheesecake. Sheet pans, cookie sheets, and jelly-roll pans are bakeware with large flat bottoms. 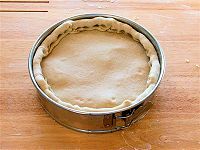 Pie pans are flat-bottomed flare-sided pans specifically designed for baking pies. ↑ Reay Tannahill. 1988. Food in History. (New York: Crown Publishers), 13. ↑ F. H. Cushing, A Study of Pueblo Pottery as Illustrative of Zuñi Culture Growth. Fourth Annual Report of the Bureau of Ethnology to the Secretary of the Smithsonian Institution, 1882-1883. (Washington, DC: Government Printing Office, 1886). Onine Reader, Project Gutenberg. Retrieved October 10, 2008. ↑ 5.0 5.1 James Beard. 1975. The Cooks' Catalogue: A Critical Selection of the Best, the Necessary, and the Special in Kitchen Equipment and Utensils. Over 4000 Items Including 200 Extraordinary Recipes Plus Cooking Folklore. (New York: Harper & Row), 174-175. ↑ 6.0 6.1 6.2 6.3 Chuck Williams. 1986. The Williams Sonoma Cookbook and Guide to Kitchenware. (New York: Random House), 8-9. ↑ Aluminium and Alzheimer's disease. Alzheimer's Society. Retrieved October 10, 2008. ↑ Marian Burros, June 7, 2006. In Search of a Pan That Lets Cooks Forget About Teflon. The New York Times. Retrieved October 10, 2008. ↑ Independent Studies Show No Detectable Levels of PFOA in Cookware Using Teflon(R) Non-stick Coatings. DuPont. Retrieved October 10, 2008. ↑ FAQ's about SiliconeZone Bakeware. KitchenKapers.com. Retrieved October 10, 2008. Beard, James. 1975. The Cooks' Catalogue: A Critical Selection of the Best, the Necessary, and the Special in Kitchen Equipment and Utensils. Over 4000 Items Including 200 Extraordinary Recipes Plus Cooking Folklore. New York: Harper & Row. ISBN 0060115637. Bridge, Fred, and Jean F. Tibbetts. 1991. The Well-Tooled Kitchen. New York: William Morrow and Company. ISBN 0688081355. Tannahill, Reay. 1988. Food in History. New York: Crown Publishers. ISBN 0517571862. Williams, Chuck. 1986. The Williams Sonoma Cookbook and Guide to Kitchenware. New York: Random House. ISBN 0394544110. History of "Cookware and bakeware"
This page was last modified on 19 June 2013, at 15:25.